Trade Deadline Day: What do the Dodgers have left to do? So, it’s been quite an eventful couple of days. The Dodgers have bolstered their rotation — something everyone thought and knew would happen — they just didn’t do it with a big-name pitcher. Yet. OK, so David Price and Cole Hamels have been dealt, and there is no pitcher of their caliber remaining on the market. But the Dodgers are still apparently in the market for a starting pitcher. Andrew Friedman: "We’ll continue to have conversations. I don't want to talk about the deadline in the past tense yet." This doesn’t mean the Dodgers are going to land a guy like Tyson Ross, but I expect them to make at least one trade before the 1 p.m. deadline. But this is a rumor that won’t go away. #Dodgers still talking about Yovani Gallardo with #Rangers, sources say. Daniel makes a fair point. If the Reds were to be talked into trading Aroldis Chapman, Wood is just the kind of player they would want. Wood’s potential departure would open up a spot for Gallardo. As a rental, he isn’t terrible. He’s also pretty adept at the plate, which is an added bonus. Giving up Wood would make the 2016 (and beyond) rotation less certain, but it isn’t like the Dodgers would pass on filling it with one or two big-time free agents (Price, re-sign Zack Greinke after he opts-out, etc.). Another reason to want Chapman: He’s connected to NL West rivals Arizona and San Francisco. The Diamondbacks are said to be awaiting the Reds’ answer on their offer. Short of Paul Goldschmidt, the Dodgers could easily beat any package the D-Backs could throw out there for Chapman. And I don’t even want to think of Chapman ending up with the Giants. Now, to get Chapman — who is a 1-win player the rest of the season (best of any reliever) — it won’t be cheap. The Reds don’t have to move him, either, but they’d be smart to (if the price is to their liking). Short of Corey Seager and Julio Urias, I’d say any- and everyone is fair game. If Wood and another minor piece could get the deal done, by all means you make that deal. If the Reds are looking for a more prospect-led package, perhaps something like Jose De Leon, Chris Anderson and Scott Schebler would work. De Leon and Anderson would give the Reds two starters relatively close to the majors and an outfielder who could step in for Jay Bruce, as soon as he’s traded to the Mets. It seems like a lot (and it is), but Chapman is easily the best left-handed reliever in the game and one of the Top 2-3 in all of baseball. He’s under team control through next season (arbitration-eligible for the final time) and would combine with Kenley Jansen to form the most dominant bullpen duo in quite some time. Remember how good Eric Gagne and Guillermo Mota were in 2003? Think that, but even better. The Dodgers adding Jim Johnson and Luis Avilan doesn’t make it any easier to acquire Chapman or another reliever. There can only be so many pitchers in the bullpen at any given time. That’s seven guys who don’t have options and/or wouldn’t normally be designated for assignment. But if Chapman or another really good reliever were acquired, maybe someone could be moved in another trade or DFA’d. The Dodgers definitely have built even more depth among their relief corps. Despite that, the Dodgers’ are projected to get 1.4 WAR from their bullpen the rest of the season — 0.9 of that coming from Jansen. So, there’s still room for improvement. Also, Chapman’s 1.1 WAR for the rest of the season is slightly better than Wood’s 1.0. It’s a negligible difference until you consider the fact Chapman is projected to do that in 38 fewer innings pitched. Look, odds are the Dodgers aren’t going to end up with Chapman. He’d absolutely be a luxury at this point. They might not end up with someone of any real significance. 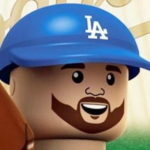 Maybe it’s a guy like Jake McGee, whom I wanted the Dodgers to look into last year. Perhaps they land a pitcher or player no one even suspects is available (ala Wood). But one thing’s almost certain: There’s no way the Dodgers are done tinkering with this roster. I mean, Alex Guerrero is still on the roster. I hate to be “that guy,” but if it means keeping Chapman away from the Giants — a team that had been unusually quiet until it acquired Mike Leake from the Reds Thursday night — I’d like to see the Dodgers snag him before the deadline. Oh, and he’s really, really, really good. If they grab him and Gallardo, I’d say it was a pretty successful inaugural trade deadline for the nerds.